Sixth day is dedicated to Goddess Lakshmi, who showers the prosperity and wealth on her devotes. She bestows with divine energy and fulfils the need of her worshippers so that they can lead a serene and contented life ahead. Sage Katyan performed severe penance to Ma Bhagwati for having Ma Durga as his daughter. Finally his wish was granted and Ma Katyani took birth in her clan due to which she is referred by this name. She is the powerful and fierce form of Goddess Durga, who took birth to end the misery created by demon Mahishasura in the abode of Gods. Devi Katyani, having three eyes and four arms is a perfect way to achieve Dharma, Artha, Kama and Moksha. Devi Katyani is also called as the Queen of Braj as she was worshipped by the gopis to get Lord Krishna as their husband. This entry was posted in Puja and tagged adore, Artha, auspicious, bestow, blessings, book now, celebration, contented, daughter, devil, dharma, divine, durga, energy, evil, faith, family, Festival, fierce, food, fortune, future, Goddess, Goddess Bhagwati Goddess Katyani, Goddess Durga, goddess Lakshmi, gopis, grace, happiness, have a little faith, health, Hindu, husband, Kama, Katyan, Lakxmi, Lord Krishna, Moksha, penance, pooja, powerful, puja, puja package, Queen of Braj, shubhpuja, shubhpuja.com, wish, worship. Removal of negativity is stabilised by the revival of positive energy so the fourth,fifth and sixth days are dedicated to Goddess Lakshmi, who showers the prosperity and wealth on her devotes. She bestows with divine energy and fulfils the need of her worshippers so that they can lead a serene and contented life ahead. 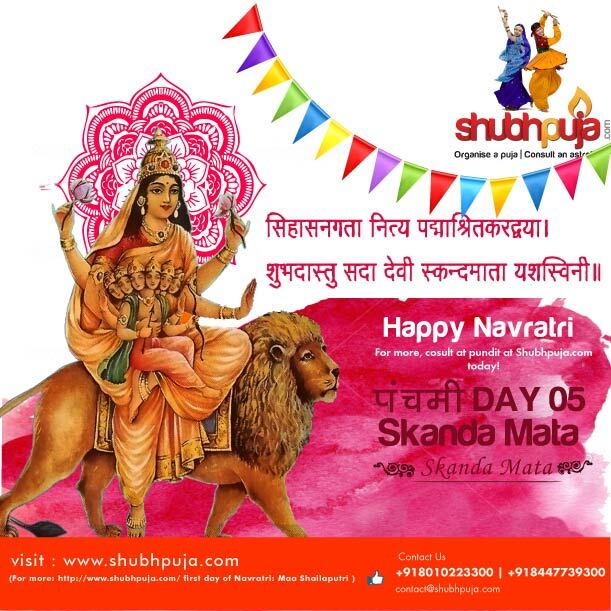 The fifth day of navaratri is dedicated to the humble and pious mother (Ma Parvati) of Kumar Kartikeya or Skanda or Lord Murugan, so she is also referred as Skanda Mata. During the fierce war between Gods and demons, Kartikeya Ji in the form of Skanda had to come to rescue and became a saviour. His glory has also been mentioned in Puranas, where he is referred as Shaktidhar. Skanda Mata Puja is way to worship the mother of Skanda to achieve the Visuddha chakra state. In this form, she holds the infant Skanda in her lap sitting in meditation posture, therefore also called as Padmasana. This entry was posted in Puja and tagged auspicious, bestow, blessings, book now, celebration, contented, devil, devotees, divine, durga, energy, environment, evil, faith, family, Festival, fifth day, fortune, fulfils, future, god, Goddess, Goddess Durga, goddess Lakshmi, Goddess Skanda Mata, grace, happiness, have a little faith, health, Hindu, Kartikeya, kumar kartikeya, Lord murugan, navratri, nine days, pooja, prosperity, puja, puja package, Puranas, serene, shubhpuja, shubhpuja.com, Skanda, worship. To cherish the glories of reverent Goddess Durga and her different forms on each day, the nine days are dedicated to her nine avatars. Removal of negativity is stabilised by the revival of positive energy so the next three days are dedicated to Goddess Lakshmi, who showers the prosperity and wealth on her devotees. She bestows with divine energy and fulfils the need of her worshippers so that they can lead a serene and contented life ahead. 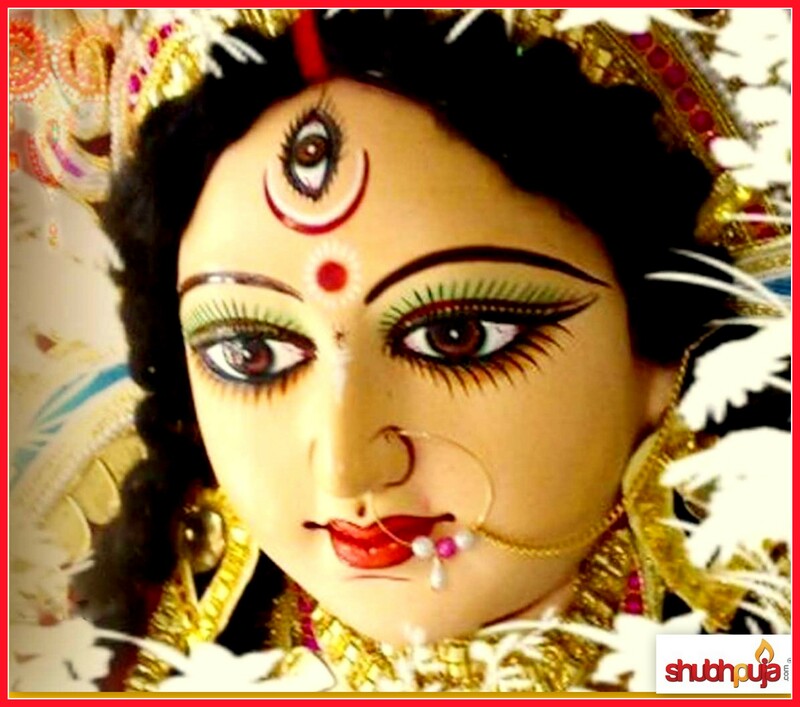 The blissful manifestation of Goddess Durga is in her fourth day avatar which is Devi Kushmanda is widely worshipped for her divine cosmic energy and smile. She is said to be the illuminator of the Universe for her vibrant smile, which clearly justifies her name- ‘Ku’: little, ‘Usma’: energy and ‘Anda’: cosmic egg or Universe. Also known as ‘Ashtbhuja’ because of her eight hands, is said to reside on the core of the sun. 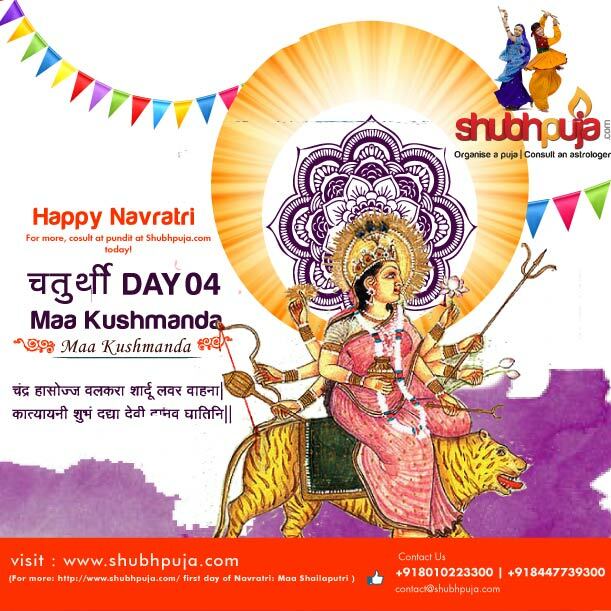 Goddess Kushmanda is worshipped for her source of light that transformed the eternal darkness into bright prosperous Universe. Her divine smile and glowing face releases all the worries of her devotees and illuminates their path of life. She is a form of ‘Adi-shakti’, who created brightness in the existing universe. This entry was posted in Mythology, Puja and tagged Ashtbhuja, auspicious, bestow, blessings, body, book now, celebration, cosmic egg, darkness, demon, devil, divine, durga, energy, environment, evil, faith, family, Festival, food, fortune, glowing, god, Goddess, Goddess Durga, grace, happiness, have a little faith, health, Hindu, illuminator, Indian, knowledge, Kushmanda, light, lord shiva, love, pooja, puja, puja package, shubhpuja, shubhpuja.com, smile, universe, worship. The first three days, Goddess Durga is worshipped to praise her divine energy which terminates the existence of evil energies in the form of demon. Her ferocious and raging form personifies the energy of mother that erupts actively when positive and righteous powers are at stake. 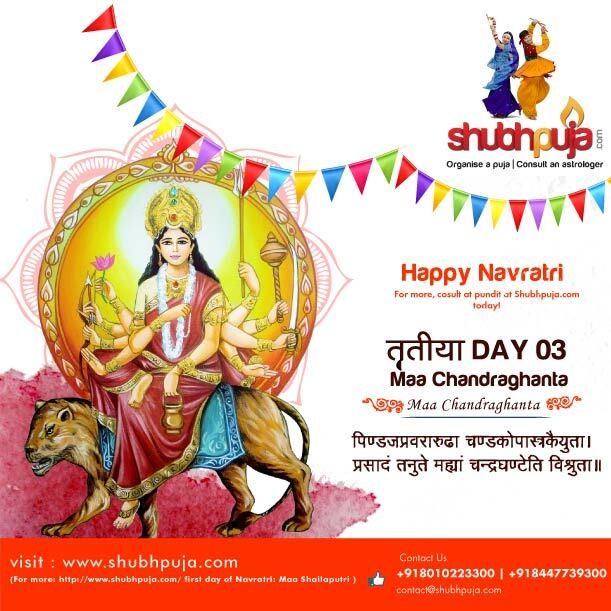 Goddess of peace, serenity and prosperity, Ma Chandraghanta is worshipped on the third day of navratri festival for her charisma and charm that captivates the devotees’ faith. Due to the half-moon bell on her head she is referred as Chandraghanta. This form of Goddess Durga is a fierce one depicting her anger against the presence of evil and violence on earth. Sitting on her lion with weapons in her 10 hands define the profound anger in her personality but at the time her vibrant and charming personality depicts her glory and fearless attitude. This entry was posted in Puja and tagged adore, ancestors, anger, auspicious, bestow, blessings, body, book now, celebration, chandraghanta, demon, devil, devotees, divine, durga, energy, environment, evil, faith, family, Festival, fierce, fortune, future, Goddess, Goddess Durga, half-moon, happiness, have a little faith, health, Hindu, knowledge, lord shiva, love, navratri, peace, pooja, positive, puja, puja package, serenity, shubhpuja, shubhpuja.com, vibrant, vrat. To cherish the glories of reverent Goddess Durga and her different forms on each day, the nine days are dedicated to her nine avatars. The first three days, Goddess Durga is worshipped to praise her divine energy which terminates the existence of evil energies in the form of demon. Her ferocious and raging form personifies the energy of mother that erupts actively when positive and righteous powers are at stake. 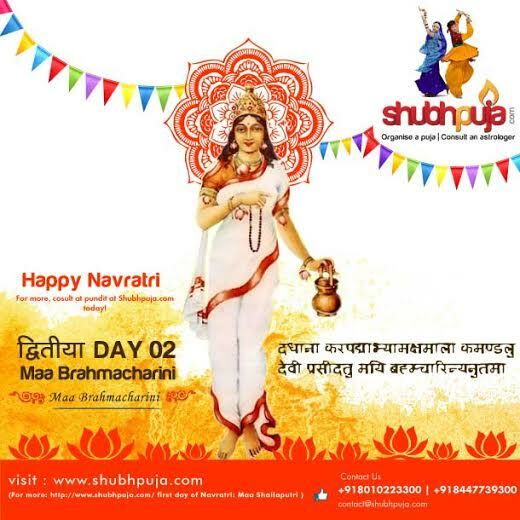 The ‘pious’ or ‘sanyasin’ form of Goddess Durga which is Goddess brahmacharini, is worshipped on the second day of navratri festival. Her severe penance (tapa) defines the loyalty and love for lord Shiva. ‘Brahma’ refers to the tapa that Ma Brahmacharini performed for thousands of years without even consuming food for achieving Shiv Ji as her consort (husband). Goddess brahmacharini puja is a sign of gaining strength and wisdom, as she is the bank of knowledge and wisdom. The worshipper attains emotional as well as mental balance to face the hard times and an inspiration to cross the darkest hours. This entry was posted in Puja and tagged avatar, bestow, Brahma, celebration, darkest, Day 2, demon, devil, durga, emotional, evil, Fast, ferocious, Festival, food, Goddess Durga, have a little faith, inspiration, knowledge, lord shiva, love, loyalty, Ma Brahmacharini, mental, navratri, nine days, nine forms, pious, pooja, positive, power, puja, reverant, sanyasin, shower, shubhpuja, shubhpuja.com, tapa, vrat, wisdom, worship. These nine days is a journey to discover our true conscious and realize the divine path of success. It offers an opportunity to get acquainted with Lord Almighty through the path of seva, satsang, meditation and Guru’s blessings. 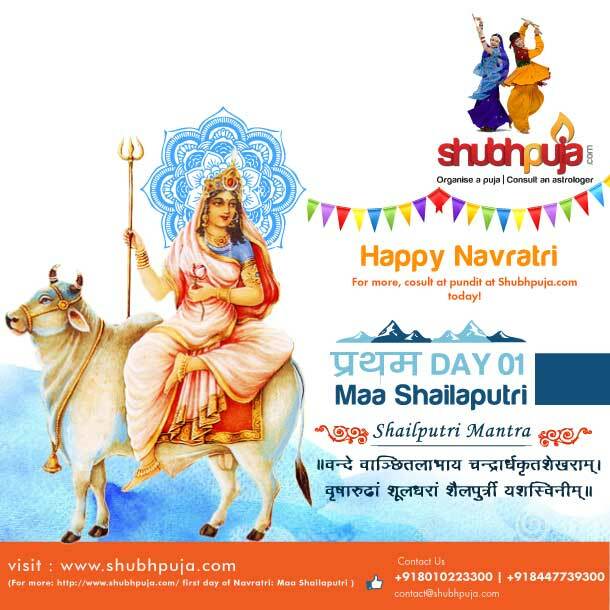 The first day of navratri is dedicated to goddess Shailputri, daughter of Parvatraj Himalaya (King of Mountains). She is beautifully adorned with half-moon on her head, holding trident and lotus in her hands, riding over her bull (nandi). Goddess Shailputri puja is a divine way to worship Goddess Parvati, who is an epitome of love and state of awareness (from Sati to Parvati). Worshipping her on the first day signifies the beginning state of spirituality, keeping the mooladhar in mind as Shailputri is the mooladahar Shakti of discovering oneself. This entry was posted in Puja and tagged auspicious, bestow, blessings, body, book now, celebration, consultation, divine, durga, energy, evil, faith, family, ferocious, Festival, food, fortune, Goddess, Goddess Parvati, grace, happiness, have a little faith, health, Hindu, hinduism, journey, Ma Shailputri, mind, navratri, nine days, pooja, puja package, realization, Sati, shakti, shower, shubhpuja, shubhpuja.com, soul, spirituality, universe, wealth, wedding puja, worship. How to make the most out of blessings during Navratri period? Every individual composed of mind, body and soul have specific identity but all are existent in this One cosmic energy. This omnipresent and omnipotent Universe is eternal and everybody is a part of it. As we blossom in this Universe and grow up within it, we get detached from our sole source and get deviated from our motive. So Navaratri is the period when certain changes are prevalent around us in the nature and environment. Similar alterations can be done within us during this period. It is the most active period when the shaktis of Goddess and Gods are increased and worshipping them can transform your being, both within and around you. While chanting mantras and reading the Vedic scripture, the soul is tranquilised and entire humanity is benefited. The energy produced during adoring the deities transforms the waves around us and spreads benevolence. The devilish or ‘asur shaktis’ can be terminated by realizing the illusion of material world and getting rid of its effects. Apart from spiritual awakening and divine knowledge, praising Ma Durga during these nine nights and days also solves your worldly issues. Concentration level increases and comes back to the stable situation, which increases efficiency in any work. Wisdom and knowledge are imparted which takes away education related problems. Personal relations among family get stronger by getting involved in the righteous work collectively. Childless couples are showered with a baby and pregnancy related issues are solved. Disputes related to property and delayed court cases get resolved. The malefic effects of planets are removed from one’s life and birth chart. Unmarried people facing delay in marriages find the perfect life partner and lead a blissful life ahead. Acute diseases and occurrence of minute health problems will be resolved and cured. Fear from certain objects and being or disturbed sleep at night will be solved. Financial debts or wealth related problems will come to an end along with materialistic growth. Thus these nine auspicious days are the perfect occasion to receive spiritual and worldly blessings and to further attain success and salvation in life. This entry was posted in Puja and tagged active, asur, auspicious, bestow, blessings, book now, celebration, chnge, durga, education, effieciency, environment, evil, faith, family, Festival, food, Goddess, grace, happiness, have a little faith, health, humanity, love, Ma Durga, malefic planets, Mata, nature, Navratri cosmic energy, nine days, package, period, pooja, problems, puja, salvation, shakti, shower, shubhpuja, shubhpuja.com, solutions, success, tranquilised, universe, Vedas, Vedic, wealth.